I love ribs, but making them has been very time consuming. That’s why I used to make them only a coupe of times a year until I purchased a pressure cooker. I used to think pressure cookers were a 80’s fad, but now I’m in love. It’s super easy and fast to make anything and everything from boiled potatoes to brisket. Not to mention baby back or beef ribs! My method is super simple: put some water into the pressure cooker. Half liter should be plenty. 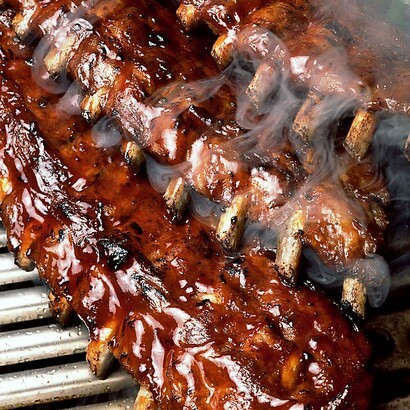 Put a steaming basket inside the pot, and curl the baby back ribs onto the basket. The water shouldn’t touch the ribs. Boil for 15 minutes in 2,2 bar (high pressure setting). Start counting the time when steam steadily escapes from the pressure valve. When the time is up, release the pressure, baste the ribs with good sauce and put them in an oven for a few minutes, until nice and brown. Turn once to give color to both sides.